The Irish Premiership matches at the Ballymena Showgrounds and Windsor Park have been postponed because of the adverse weather conditions. 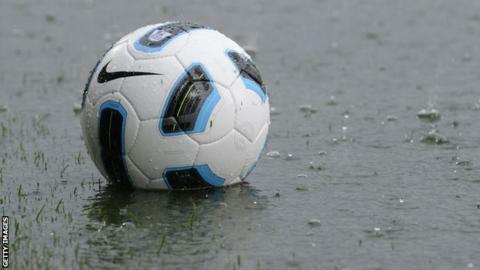 The decisions to call off the games between Ballymena United and Carrick Rangers and Linfield and Dungannon Swifts were taken following pitch inspections on Saturday morning. The Ballymena v Carrick game has been rescheduled for Tuesday 19 January. The day's other three games went ahead as scheduled. Leaders Crusaders beat Glentoran 4-2 at Seaview, with Glenavon drawing 3-3 with Cliftonville and Warrenpoint Town defeating Coleraine 3-0. Friday night's scheduled game between Ballinamallard United and Portadown at Ferney Park was postponed and has been rearranged for Monday 15 February, with a 20:00 GMT kick-off.